Italian architect, sculptor and interior designer, the leading sculptor in Naples in his days. His prowess in many fields of art and his remarkable facility of production led him to a position of unchallenged supremacy in 17th-century Neapolitan architecture, where his styles exhibit every nuance, from the severe classicism of Early Baroque via an exuberant use of coloured marbles and the occasional exploitation of Mannerist detail, to a scenographic Late Baroque. His culture was that of the Counter Reformation and his taste was all for decoration; from his school arose the plastic style of southern Italy, with fountains and pulpits, railings and altars, and polychrome inlays. 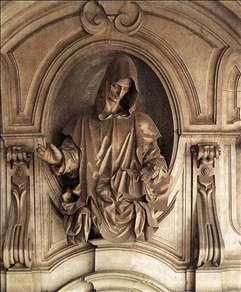 His Prophets in the Gesù Vecchio are dynamic figures, with sharp-edged draperies and emotive plays of light; the Virgin and Child in the Certosa of San Martino is contorted and richly worked; the large bronzes in the Cappella del Tesoro in the Duomo, from near the end of his career, celebrate San Gennaro, the patron saint of the city. For thirty years Fanzago worked on the decoration of the Certosa (Carthusian monastery), where he produced his most highly wrought works. In spite of brief stays in Rome, his style is closer to the Counter Reformation trend of painters like Cerano (Giovanni Battista Crespi) and Morazzone than to the winning voice of Gian Lorenzo Bernini. See more details about "St Bruno"